FORT MYERS, Fla. -- Make way! 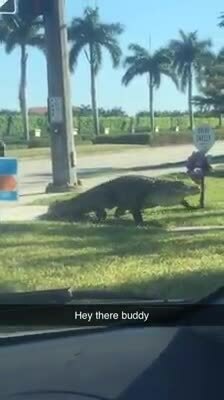 A Fort Myers resident captured video of a monster-sized alligator that appears to have just crossed a busy road. Chelsea Brinson shared this video with Fox 4, showing a massive gator strolling just off McGregor Boulevard at Pine Ridge Road. She posted it to Facebook Friday morning and it quickly went viral, with well over 1,000 shares before 3pm.